When we started our business we advertised and beat the bushes for clients. We wrote content on our blog, advertised on social media, ran a few Google CPC campaigns, and did a TON of real world and online networking just to get the ball rolling. These efforts resulted in enough business to get started but they took a lot of time, effort, and money. As our business grew, so did our understanding of our expertise, our ideal clients, and our competition. That knowledge helped us create a list of keywords we could expect to rank for in the search engines. And that knowledge informed our search engine optimization strategy (SEO). Nearly four years later, our hard work and SEO efforts have paid off. Now, even though the internet is a very busy place, we’re solidly positioned on page one for several of our keywords. The right clients can easily find our website and book a sales consultation. Due to our SEO strategy, new clients are able to find us organically in their Google searches and we continue to grow—without spending a dime on advertising. The benefits we’ve gotten aren’t due to some secret, they’re the results of understanding a few basic SEO principles like—the main pieces of a good SEO foundation, effective keyword research, and knowledge of the built-in Squarespace SEO targeting features. Almost any business can do exactly what we’ve done and get similar results. Sometimes, during sales consultations, we’ll speak with people who “don’t really care about SEO.” Since we specialize in building websites that actually work (improved conversions and sales with less effort) we shake our heads. Being in business is hard enough. Don’t make it harder for yourself by turning a blind eye to one of the most effective marketing strategies there is...good SEO. SEO increases your website traffic. Being on the first page of search engine results (SERP) for the right keywords and keyword phrases gives your website an opportunity to get increased impressions and clicks. Ranking in top positions can generate significant traffic increases for your website. An effective SEO strategy is built upon informative and keyword-relevant title tags and meta descriptions because Google matches these to search queries. Optimizing your tags and descriptions helps increase click-through rates, which also increases your qualified web traffic. Effective SEO provides trackable and quantifiable results whether you have an e-commerce site or a service-based business like ours. SEO makes is possible to track every aspect of your marketing strategy and make tweaks when necessary to increase your traffic, rankings, and conversions. Google Search Console provides data and tools so you can check the indexing of your site and monitor your results. This enables you to consistently optimize the visibility of your website. Google Analytics , on the other hand, tracks and reports details of your website traffic. Google Search Console: A tool to understand how Google looks at your website. How it’s ranking it. How your website is performing and improvements you can make to help your site rank higher. Google Analytics: A tool to understand all the traffic coming to your website. What people are doing and how they’re interacting once they’re on your website. Additionally, Squarespace has built-in website analytics. The data provided through the Squarespace analytics dashboard is accurate and useful, however, Google Analytics gives you deeper analysis and understanding of your web traffic and the ability to set up specific goals to track your conversions. SEO is the most cost-effective way to market your business online. Website traffic generated from effective SEO is more targeted than many other marketing strategies. With great SEO, website visitors are essentially pre-qualified. A high percentage of them are actively looking to purchase your products and services. Inquiries that come in via SEO traffic are the real deal. These clients sought you out, have problems you can solve, and simply want to determine if you’re a good fit. Additionally, organic search engine rankings receive 85% more clicks than paid advertising. Many online shoppers tend to skip paid advertisements because they trust organically ranked businesses over paid advertisements. By investing in an effective SEO strategy, you will likely gain more traffic than your competitors who are paying for ads for the same keywords. SEO instantly increases your credibility. It takes patience, experimentation, and a learning curve to rank on the first page of Google, but being there instills trust and instant credibility for your business. People trust Google. The higher your rank position, the more chances you have for customers to see your content and trust your brand. Effective SEO promotes your business 24 hours a day. Your search engine rankings don’t ever take a break. Great SEO increases your website traffic all day, every day—to all the time zones on Earth. Once you’ve ranked on the first page of Google, your results will do the heavy lifting of promoting your business while you’re sleeping, while you’re relaxing on the weekend, or while you’re on vacation. SEO is the smartest marketing investment you can make. An effective SEO strategy is a long-term asset to your business. It generates website traffic, well-qualified leads, and most importantly—sales. Your customers are using Google to search for your products and services right now. If you want to grow your business without relying solely on cold calls, referrals, networking, or social media advertising—then you might want to consider investing in an effective SEO strategy. What does an effective SEO strategy include? SEO can feel super technical and complicated to the average business owner. Don’t feel bad. It was for us too in the early days. Most of our clients have no idea where to begin. Keywords are at the heart of SEO, and choosing the right ones can make or break your SEO strategy. Most people guess about their keywords. The thing is, identifying the right keywords for your business is not a guessing game—to pinpoint the best keywords for your business you’ll need to analyze some data. Google Adwords is a free tool you can use look at keyword data. Over time, we discovered the limitations of Google Adwords and invested in more robust applications to help us navigate SERP with increased accuracy for ourselves and our clients. In short, keywords should be relevant to your customers and their specific problems. Keep in mind—no matter the tool you use, search volume and search competition are critical to choosing the right keywords for your website. Build a keyword-focused website. It’s easy with Squarespace. This is an area where Squarespace really shines. The platform has many built-in SEO targeting features and unlike Wordpress, Squarespace doesn’t require 3rd party plugins to get great SEO results—these tools are engineered into the product. If you want to learn more about Squarespace SEO, feel free to read this documentation. This is another area where Squarespace excels. Squarespace makes it simple to publish keyword-driven content. Relevant, well-written content that is published on a regular basis is SEO dynamite. We wrote a great article about adding SEO to your Squarespace blog posts, you can check it out right here. This is an important step in legitimizing your business with Google. It allows you to verify your business information by requesting a code on a postcard from Google. Setting this up is worth the effort even if you’re an online service-based business that doesn’t actually provide services from your business address. Get started right here. Verify your website and send a sitemap to Google. This is an important step that many small business owners neglect. Google Search Console is a free tool that helps manage your website’s presence in Google search results. Don’t be intimidated, it’s very easy to do and here’s a link to a step-by-step guide. Also, you should install Google Analytics to monitor your website traffic and learn which pages of your website are popular which pages are ineffective. An effective SEO strategy is an important part of building and sustaining any business whether you’re just getting started or have been serving your customers for years. 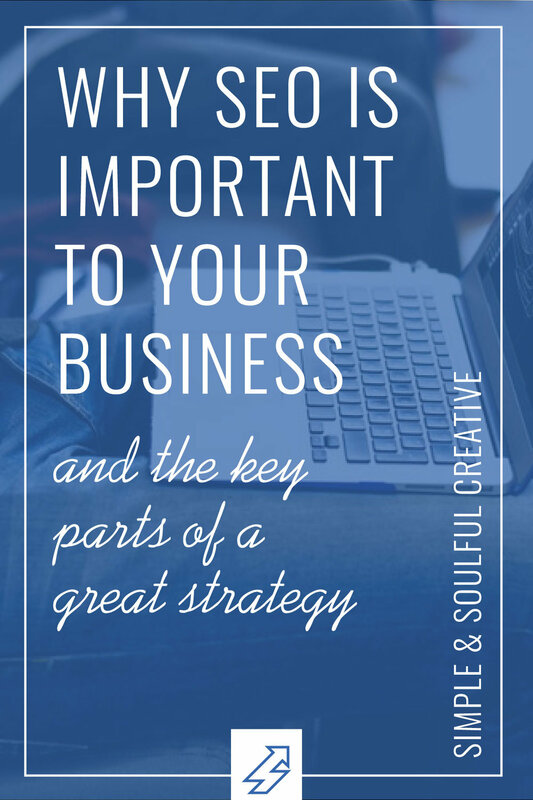 Investing the time and effort to put together an effective strategy will pay big dividends to your business by effectively connecting you with a constant stream of potential clients. If SEO feels too complicated or you just don’t have time to develop a great SEO strategy for your Squarespace website, give us a shout. We would love to help you build your business.